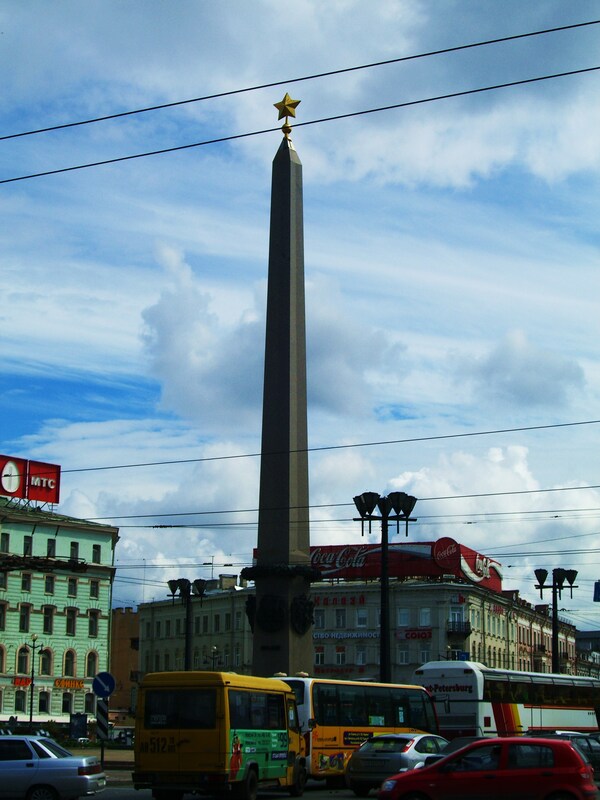 I left for St. Petersburg in June 2007, having won a scholarship to attend a two-week long literary conference. 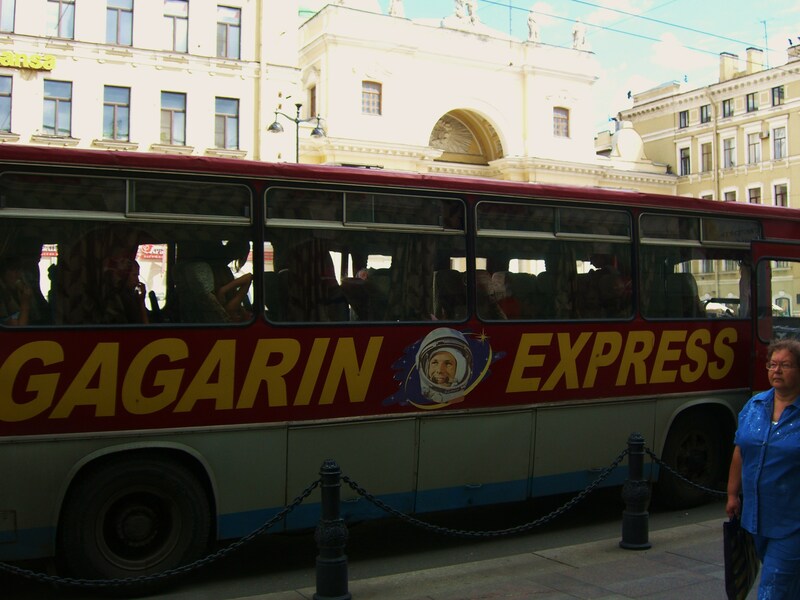 With my fledgling Russian backed by a 100-level textbook and a second hand travel guide, I landed in city that has the capacity to enrapture you, shock you – change you – if you give it the chance. Myself and the great Alexandr Sergeyevich Puskin. Nevesky Prospekt is the largest street I have ever seen. 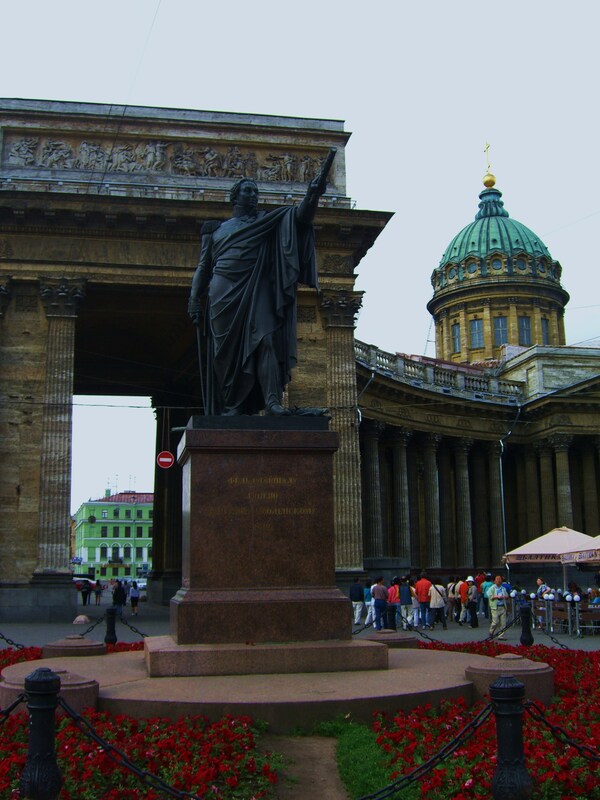 Kazan Cathedral, on Nevesky Prospekt. It is a six lane free for all, with luxury cars, fold-up minivans, off duty cabs, soviet era trolley cars and the odd, slightly-crazed biker all jockeying for position on the road. The street is flanked by pink and green palaces, whose thinning paint and rust-stained statues compete for your attention with multi-coloured, cavernous cathedrals, renovated, glistening pharmacies (whose windows advertise the sale of anti-cellulite cream) and extravagantly priced furriers that require a password upon entrance. On the sidewalks sit the legless ex-soldiers, wearing their cigarette stained army uniforms, silently staring at their skateboards and starving dogs. I like to walk the two blocks to the bookstore on the corner of Gribeodov Canal, just to stare at the Church of Spilled Blood. It is a kaleidoscope of grotesque baroque and neoclassical absurdity. One block of Nevesky Prospekt. As I make my way to the university, I smile at the dedushka who parks himself outside the twenty-four hour “Kafe haus.” I have never seen someone play a saw with a violin bow before. His thick glasses reflect the glare of a neon sign blinking “cigarettes!” from across the street. I think about buying apple blini from the vendor across the road. Russia makes me both homesick and brave. The first time I rode the metro, I was by myself. This was no mean feat. Over two million people take this form of transit every day. At some stations, you can’t see where the trains are coming from, because station doors (which control the the train doors) do not open until the cars come to a complete stop, in order to prevent people from killing themselves on the platforms. 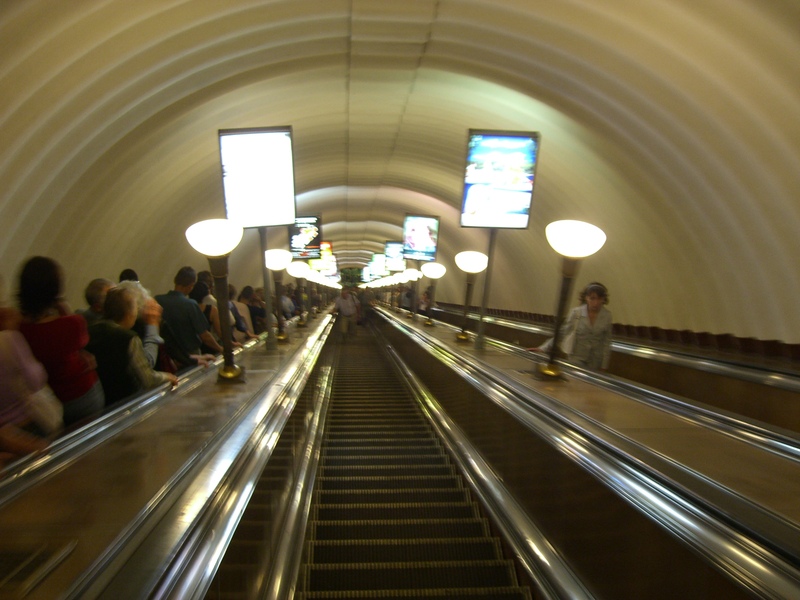 Also, because Peter the Great had his city built smack dab in the middle of a soggy bog land, the station is almost one hundred meters below ground, and when I took a photo at the top of the escalator, I couldn’t see the bottom. The view from the top of the escalator. In order to purchase my zheton (fare token) I cue up with what approximately two hundred others. Our bodies are packed together, and I’m not sure what line I’m standing in. We are a sea cacophony. I clutch my rubles so tight that I can’t get the smell of the copper coins out of my skin for almost two days. Voices buzz and squawk out of every possible channel. It discombobulates. Overhead speakers crackle, cell phones yammer, children cry, students gossip. My roommate Laura told me that she is afraid to descend this far underground, for fear of an earthquake. She doesn’t want to meet any of the 40,000 Swedish POW’s whose bones act as cement for the St. Petersburg metro, its cars and their tracks. When I finally make it to the front of the line, the woman behind the (what I think has to be) bullet proof glass looks as though she has been living in her cubicle for the past three days. Boredom is etched in her face: thin lines crisscross the width of her forehead and a sheer glaze coats the contours of her eyeballs. Stands of hair spill from her sloppy bun, and her blouse is done up Samedi-Dimanche with the top buttons askew. Her slightly-parted mouth looks to be stuck permanently in mid-yawn. 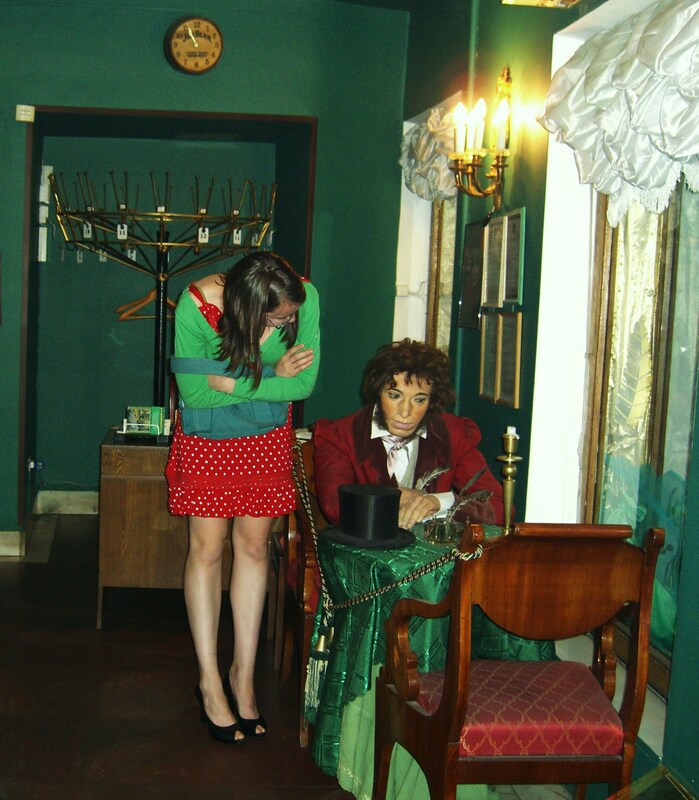 “Odna zheton,” I tell her, slipping the money through the tray. She doesn’t even look at me, as she passes me back one tiny metal token. I immediately slip it into the slot of the turnstile to my right. Amazingly I am granted the right to pass. Visions of large, moustachioed men looming out of invisible corners, interrogation chambers and confessions slips slink back into my subconscious. It is only now that I realize how hard my heart had been beating; with each breath I take, I can feel it punching again and again against the fabric of my t-shirt. When the train comes I walk into the car and sit down. As it begins to move, the sensation of the ride feels the same as back home. Indeed, everyone around me looks the same as back home. Everybody is minding their own business and pretending that they cannot see the other passengers, just the same as back home. However, I count the number of stops until I have to get off because unlike back at home, I cannot understand the station announcer.